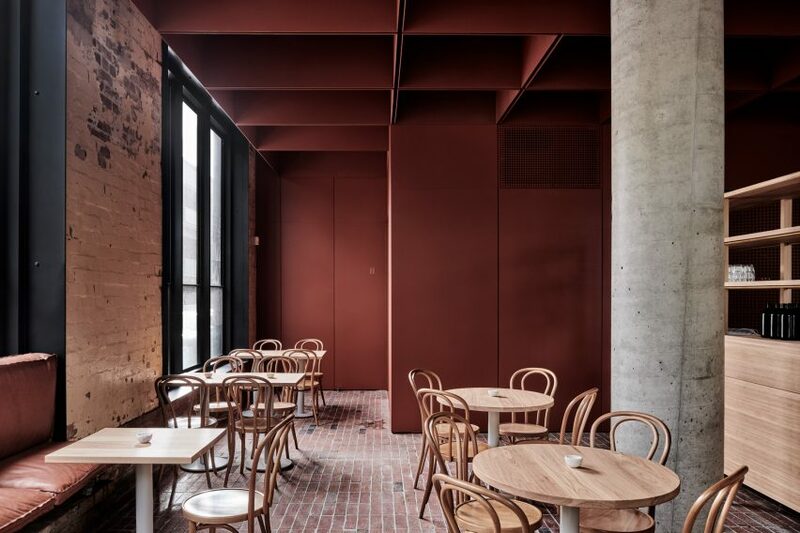 Australian practice Ritz & Ghougassian used the worn red brick facade of this cafe in Melbourne as the reference point for the design of its interiors. 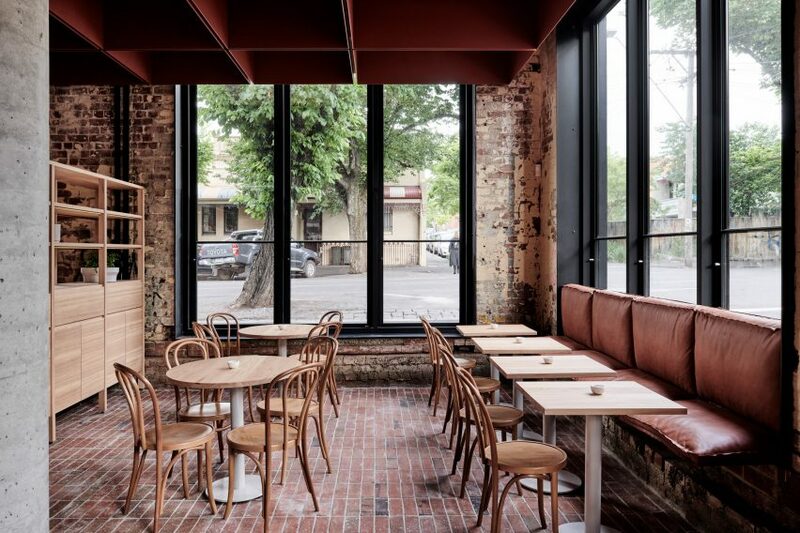 The Bentwood cafe is set within the suburb of Fitzroy, an area of Melbourne well-known for its eclectic selection of eateries and bars. During the 20th century the building had been home to wooden furniture manufacturers C F Rojo & Sons, before becoming showroom for German brand Thonet. It now belongs to local coffee connoisseur Julien Moussi, who approached Ritz & Ghougassian to transform the 190 square-metre premises into a “unique space that pushed what a cafe should look and feel like”. Set with this largely open brief, the architects decided to reference the colour and material palette of the building’s exterior in the decor of its internal spaces. “There wasn’t a whole lot that was left other than the original red brick facade. However, I think the essence of its past are still there,” Jean-Paul Ghougassian, director of the practice, told Dezeen. 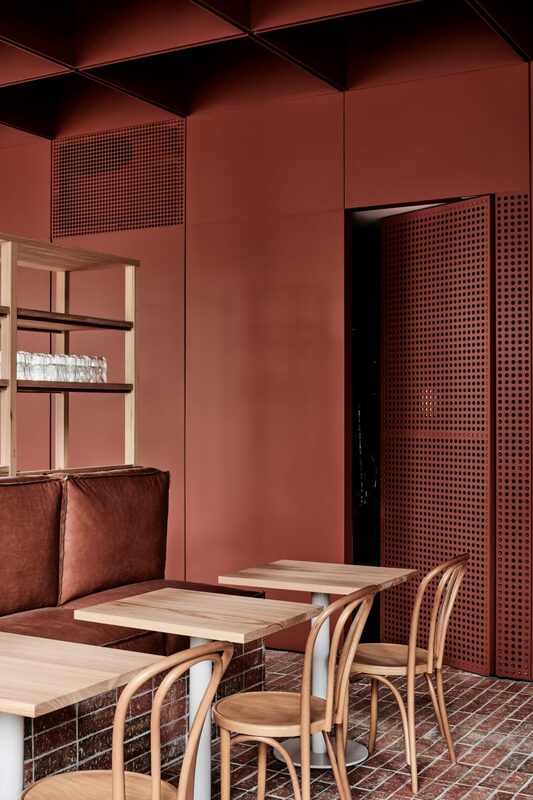 One of the cafe’s peripheral walls has been clad with panels of russet-hued steel, some of which are perforated to allow glimpses into the kitchen. Sheets of steel primed with red oxide have then been used to form a deep gridded ceiling, which the architects hope will create “pockets of light and shade, volume, and intimacy”. “A combination of prototyping and working closely with engineers and our contractor to create an effortless, seemingly floating ceiling span,” explained Ghougassian. Warm timber chairs, tables, and shelving units also appear throughout the cafe in reference to the building’s former occupants. Clay-coloured leather cushions have been used to dress the bench seats. 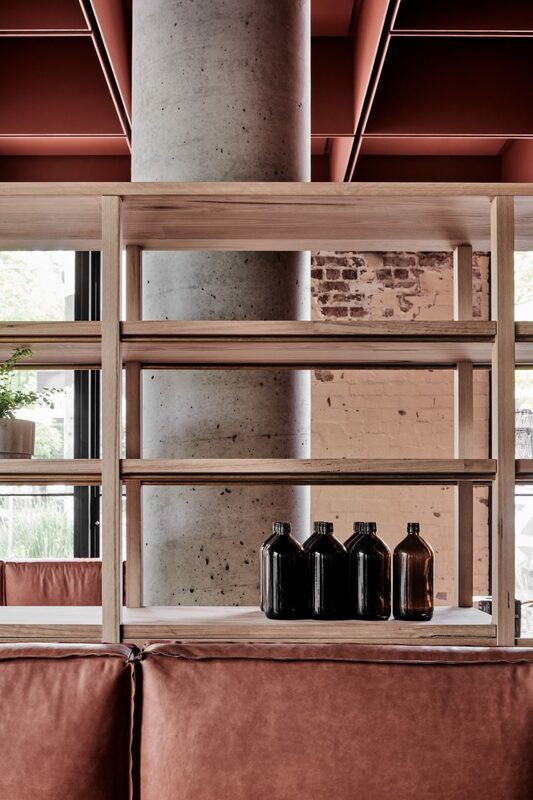 While most of the brick walls have been left in their found state, a handful of chunky concrete columns have been inserted as a subtle visual nod to Fitzroy’s industrial heritage. 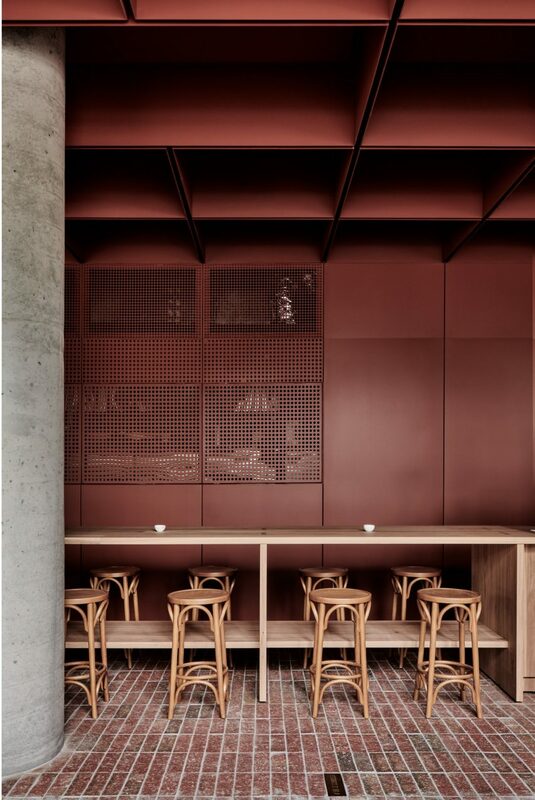 Australian design studio Biasol also applied terracotta hues to a restaurant in Melbourne’s South Yarra neighbourhood, whose aesthetic was inspired by the “evocative earthiness” of Middle Eastern architecture.